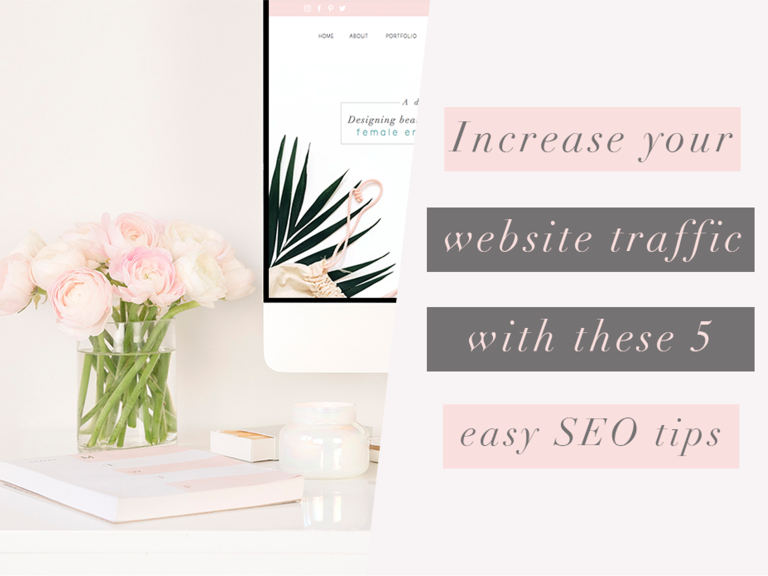 Increase your website traffic & Google ranking with these 5 easy SEO tips | Blog | Azalea Design Co. So now I'm going to remind you of the word that you've probably been trying to ignore. The term that seems very technical and confusing and there's no way that you've had the time or the effort to properly sit down and figure it all out. That is why I have written 5 super easy and quick SEO tips to help increase your website traffic & Google ranking. So first of all, what is SEO? SEO stands for Search Engine Optimisation. As Google explains, "it is the process of maximizing the number of visitors to a particular website by ensuring that the site appears high on the list of results returned by a search engine." When somebody searches for what your business/blog offers, of course you want them to be able to find you. However, the internet is a big place. With over 1.8 billion live active websites, you need to enhance your SEO to be able to have the upper hand and be noticed. How can I enhance my SEO? First of all I would just like to clarify that by following these tips, will not guarantee your website to appear first on Google's list. I once had a potential client tell me that they wanted a brilliant website that ranked #1 on Google. I had to tell them that although I can design them a great website, unfortunately I have no control of Google's rankings. Of course I can maximise the SEO to help rank higher, but achieving #1 is what everyone wants and strives for. So with all that said, let's get on to the SEO tips. Before we begin, it is super important to start doing some keyword research for you business website/blog. This is so you get an understanding of what your potential customer is searching for when trying to find your company. It is a great idea to start with a search engine, like Google. Simply, start writing down of all the keywords/phrases that come to mind when thinking about your business. E.g If you had a website selling yoga classes in London, start by typing that into Google search and see what other business come up and take note of what keywords and phrases they have use to rank high on Google. Type in your selected keywords and see how popular they are and who else is using them. This is a great way of identifying the keywords that will help you expose your website without drowning in the crowd. Now that you have your effective keywords, it is now time to put them to action. Start by going into your website's SEO and create a great title and description from a mixture of your keywords. For example: Let's say you need to create a great title for your web design business. We provide responsive and interactive websites to help music artists stand out from the crowd and connect with their audiences. Based in London and have ten years of experience. If you run a blog, adding your keywords into the content can be very beneficial!